The Sea Life Pathfinder Panel is a colorful and detailed toy that encourages children to develop eye-hand coordination while having fun! With a variety of exciting paths available, kids will enjoy moving their ocean friends from one destination to another. So encourage your child to fine-tune their logical thinking skills as they participate in underwater explorations with the Sea Life Pathfinder Panel. Ages 3+. 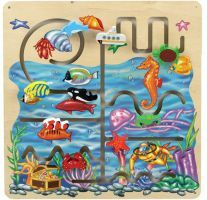 Includes wooden hand-painted crab, dolphin, two fish, seahorse, starfish, submarine, turtle, and whale pieces.